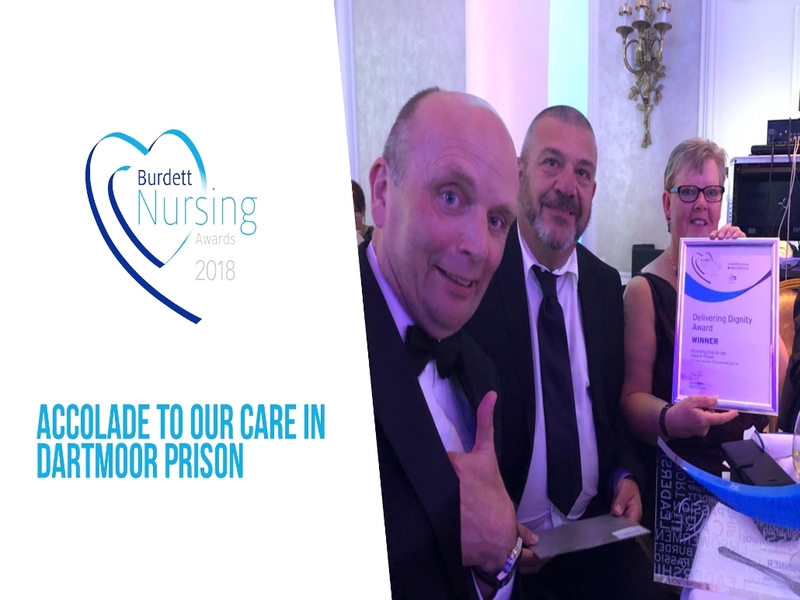 In our ambition to be a ‘Hospice without Walls’, taking our compassionate end of life care to more people regardless of their circumstances, we have been reaching through the walls of Dartmoor Prison to look after inmates facing their last days – and have won prestigious national recognition for our pioneering project! As finalists in the Delivering Dignity category of the Burdett Nursing Awards, which celebrate good nursing practice, the team behind this groundbreaking work, St Luke’s Community Nurse Specialists Martin Thomas and Derek Hart, plus Care UK’s Sheridan McGinlay, who they work alongside at Dartmoor, were in London recently for the glittering awards ceremony. They were ecstatic to not only take first prize in their category, securing a £20,000 grant, but to receive the accolade of being overall winners of the awards, adding an extra £10,000 to their pot so that they can build on the project’s success. It was in 2015 that St Luke’s launched the End of Life Care in Dartmoor Prison project aimed at improving access and increasing end of life care for prisoners, helped by a Burdett Trust grant. Since then, in an environment many would find challenging, Martin and Derek have helped change the way Dartmoor delivers end of life care, creating a blueprint for other prisons in the process. Despite its 630 prisoners, an ageing demographic and high levels of chronic diseases, the prison was referring just a small number of patients for specialist palliative care. As was apparent to our team, this was related to a lack of understanding of, and low expectations around, end of life care. However, with the prison’s Healthcare Team keen to change this, our team worked in partnership with them to facilitate positive changes through regular meetings and clinics, as well as staff training. Thanks to this approach, and despite considerable challenges around prison security, the internal drug culture and Victorian prison wings, the number of prisoners accessing end of life services has increased seven-fold, care is patient-centered and integrated, and there is greater choice for prisoners in the care they receive. Importantly, the prison’s culture is now more compassionate. A ‘buddy system’ is seeing inmates support each other by giving practical help to the less able, and they are also receiving training to become listeners. In addition, there’s now a dedicated wing for those who require care, and good take up of St Luke’s Advance Care plan, which lets staff know the individual’s wishes if that person is unable to speak up for themselves in their last days.